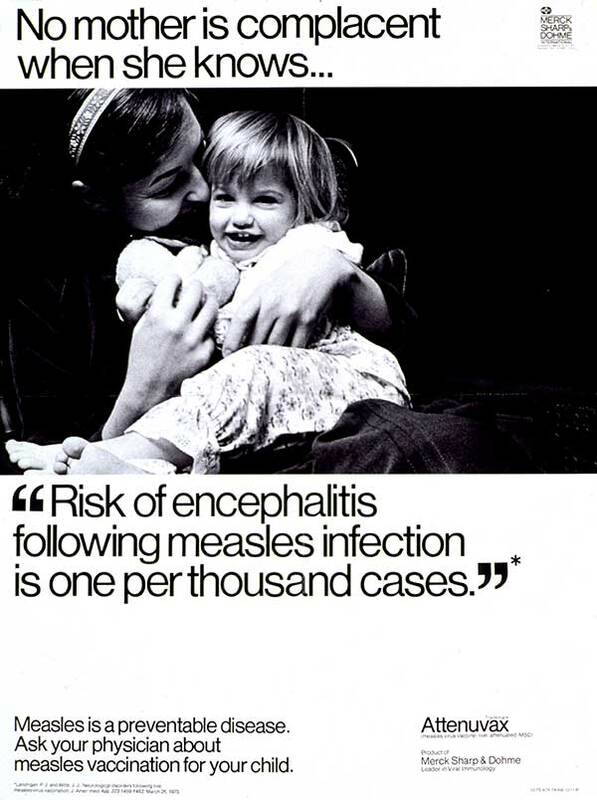 Universal measles vaccination was only introduced in South Africa in the 1970’s. Before that, this virus left many children (largely from the poor, black and coloured populations) either dead or with permanent handicap due to lung, brain or eye damage. Clinical data: This girl had chronic lung disease that began shortly after she had measles at the age of three years. The measles was complicated by pneumonia that required hospital admission. Over the ensuing months she had periodic episodes of productive cough, pyrexia and breathing difficulty that were found to be due to bronchiectasis. 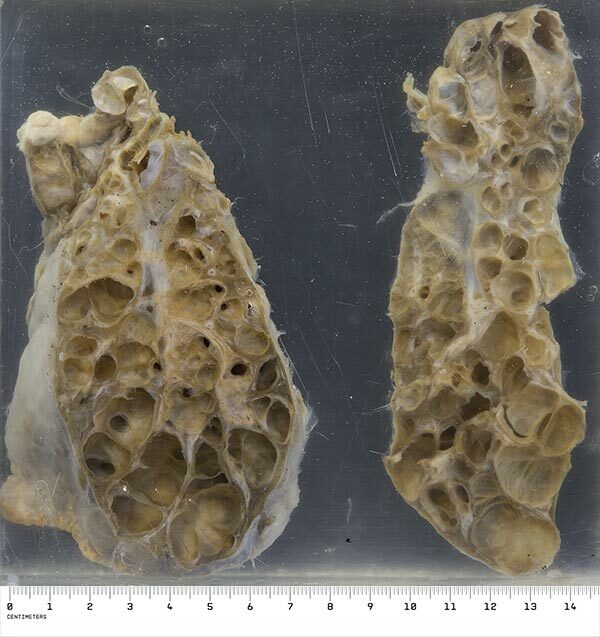 The predominantly affected left lung was resected eight years later when it was considered to have minimal function and to be the main site of persistent chronic suppurative inflammation. 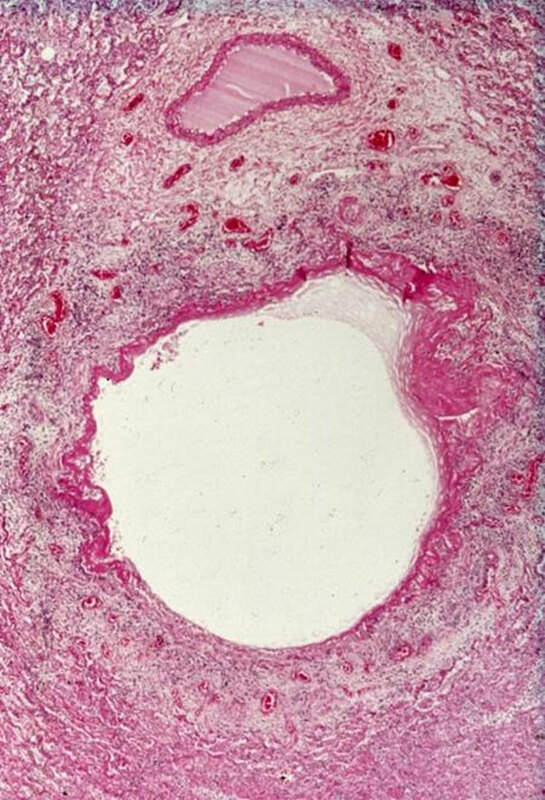 Macroscopically: The cut surface of the lung shows a multicystic appearance with hardly any remaining functional lung parenchyma. Microscopically: The severe necrotising effect that adenovirus infection has on muscle and elastica in bronchioles is demonstrated as neither muscle nor elastica are still recognisable in the ectatic bronchiole. Comment: The depression of cellular immunity that follows measles, especially in children with subnormal vitamin A reserves, often allows a supervening bacterial or viral infection of the respiratory tract. The usual culprits are Adenovirus, Herpes simplex or Staphylococcus aureus. Supervening Adenovirus and Herpes Simplex virus infections are known to have a severe necrotizing effect on tissues and infection is persistently relapsing. The muscle and elastica of bronchioles and bronchi are especially vulnerable to destruction. Prolonged ongoing destruction of bronchioles usually leads to antibiotic-resistant bacterial infection with the development of lung abscesses, peribronchial fibrosis and ultimately cor pulmonale. "SILENT CASUALTIES FROM THE 2009 / 2010 MEASLES OUTBREAK IN SOUTH AFRICA"
Between late 2009 and September 2010, 17000 reported cases of measles occurred in South Africa, largely due to suboptimal vaccine coverage. The total number of cases with neurological complications has not been documented, but in a 4 month period eight patients with subacute measles encephalitis (SME) were seen at Groote Schuur hospital. This was the largest series of SME ever recorded. All patients had advanced AIDS . Clinical data: The patients presented approximately 4 months after having a rash, with focal or generalised seizures, and in some cases acute loss of hearing or vision. 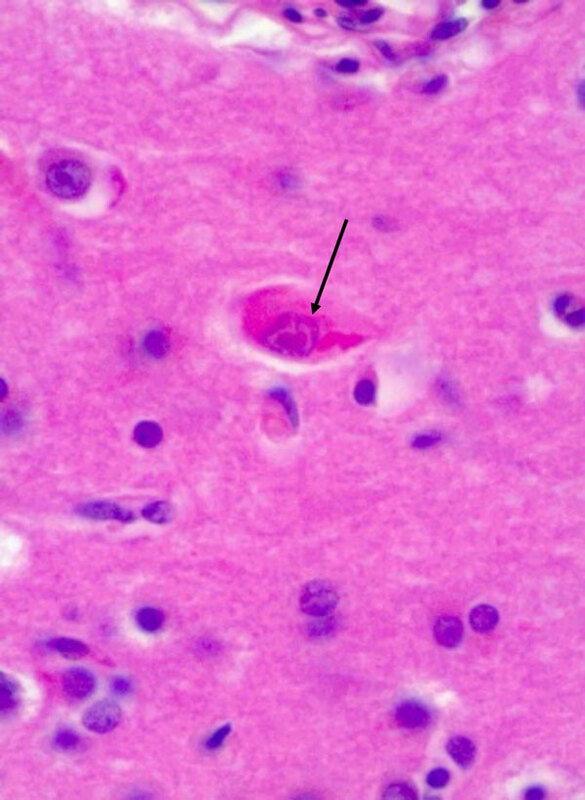 The encephalitis was progressive and fatal in six of the eight patients in this series. 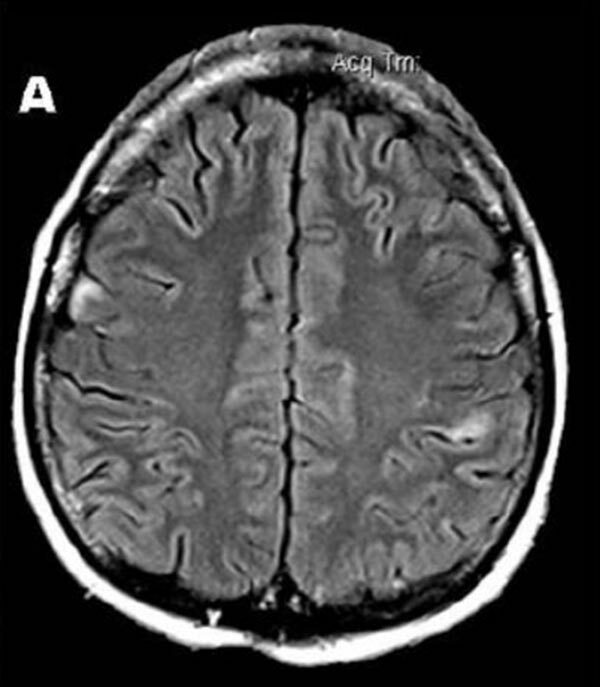 MRI showing multifocal grey matter lesions. 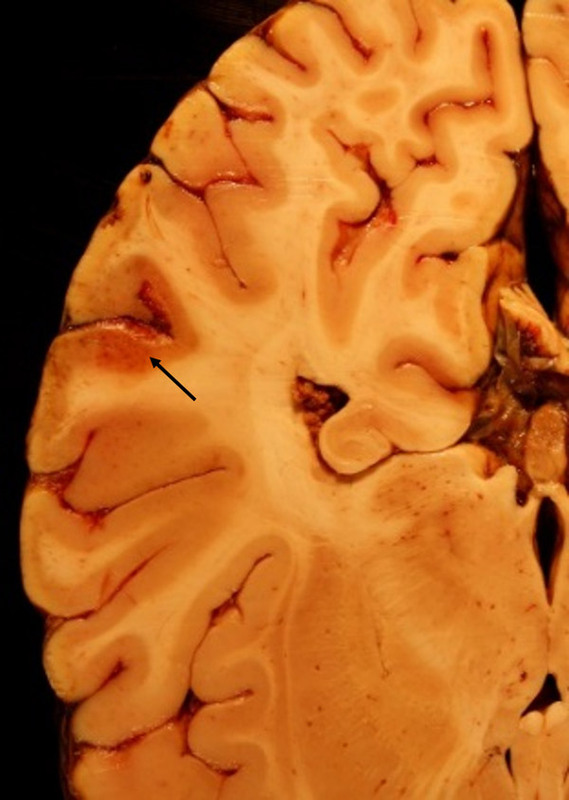 Macroscopically: Patchy congestive discolouration of the cortex. Microscopically: Intra-nuclear and intra-cytoplasmic inclusions typical of paramyxovirus infection. Albertyn C, van der Plas H, Hardie D, Candy S, Tomoka T, Leepan EB, Heckmann JM. Silent casualties from the measles outbreak in South Africa. S Afr Med J. 2011 ;101(5):313-7. Perry RT, Halsey NA. The clinical significance of measles: a review. J Infect Dis. 2004 ;189 Suppl 1:S4-16.